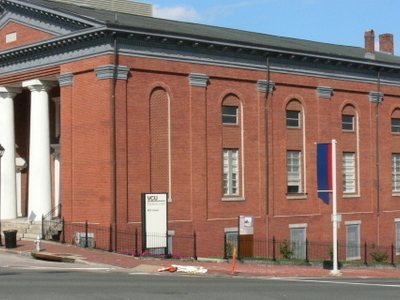 The First African Baptist Church of Richmond, Virginia is a prominent Black church. Founded in 1841, its members initially included both slaves and freedmen. It has since had a major influence on the local black community. At one point, it was one of the largest Protestant churches in the United States. The First African Baptist Church was founded in 1841 by a group of black members of Richmond's First Baptist Church. The First Baptist Church housed a multiracial congregation from its beginning in 1802 until the white members of the congregation built a New Church in 1841. In the years leading up to the split, whites were a minority at the church–a fact which made some of them uncomfortable. Many black members had also called for a split because they were often denied entrance after the building became crowded. After they built a new church building for the white members of the First Baptist Church, the church leadership sold the building that they had been meeting in to the black members. It was then renamed by adding "African" to the title. Most of its early slave members were initially from the Tidewater region of Virginia before they were hired to businesses in Richmond. Many freedmen traveled from other cities to attend its services, as well. In 1876 the original building was torn down and the congregation dedicated a new building in 1877. The building was located at The Corner of College Street and East Broad Street. The original church building was soon demolished, an act which brought accusations of "a true lack of American veneration for old things" from Harpers Weekly. Architect Thomas U. Walter designed the new building, using a Greek Doric temple design. Many of the white congregations in Richmond used a similar style when constructing their churches. Here's the our members favorite photos of "Churches in Richmond". Upload your photo of First African Baptist Church!